A dairy farm in North Troy, Vermont, is using an innovative technology to convert farm waste products, such as manure, into electricity. The project was funded with assistance from USDA. USDA Rural Development Vermont State Director Molly Lambert added, “Expanding the nation’s renewable energy sources is a priority of the Obama Administration and Agriculture Secretary Tom Vilsack and is consistent with a memorandum of understanding the United States signed in Copenhagen last December to work together with dairy producers to reduce greenhouse emissions by 25 percent by 2020.” She was joined on the tour of Chaput Family Farms by Rural Business-Cooperative Service Administrator Judith Canales and Farm Service Agency State Executive Director Robert Paquin. The 300 kilowatt anaerobic digester system that the USDA officials toured at Chaput Family Farms will digest manure from a dairy herd, produce biogas and combust the gas to generate renewable energy on a continuous basis, and provide digester effluent for use as crop fertilizer and for cow bedding material. USDA Rural Development helped finance the digester with a loan and grant through the Rural Energy for America Program (REAP), authorized through the 2008 Farm Bill. The farm will produce all of its on-farm electricity, heat, hot water and bedding for the cows. It will sell the excess power to the local utility. The excess bedding will be sold to local farms. USDA is extensively involved in renewable energy development efforts. The REAPprogram provides development assistance, grants for energy audits and funds to help agricultural producers and rural small businesses purchase and install renewable energy systems and make energy efficiency improvements. NRCS provides technical and financial assistance to producers for anaerobic digesters through the Environmental Quality Incentives Program (EQIP), and this year funded four new digesters in Vermont. NRCS offers technical and financial assistance for practices that are necessary components of anaerobic digesters; such as waste storage facilities, waste transfer, composting facilities, solid/liquid waste separation, nutrient management, and many others. NRCS developed the Agricultural Energy Management Plan (AgEMP) Conservation Activity Plan that can assist producers with on-farm energy conservation. USDA’s Farm Service Agency (FSA) recently implemented a new conservation loan program that can be used to finance anaerobic digester projects that have been approved by NRCS. FSA will make direct conservation loans of up to $300,000, and will guarantee loans made by commercial lenders up to $1.12 million. FSA conservation loans can be made in conjunction with grants and other commercial financing. More information about USDA renewable energy programs is available from any State USDA office or by going to: http://energymatrix.usda.gov/. Chaput Family Farms is a partnership of brothers Reg and Mike Chaput. Their legal partnership began in 1991 and was the result of the consolidation of four farms owned individually by Reg, Mike and their father Leo. 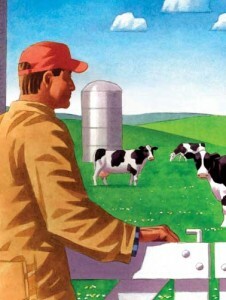 The 1,800-acre farm milks about 830 cows. The digester was constructed to accommodate future expansion and is designed to handle manure from 1,600 mature cows plus young stock. The farm has also participated in EQIP to improve water quality concerns around the barnyard.